I was recently carrying out work for a client to upgrade their existing TM1 10.2.2 environment to Fix Pack 1. Once I installed Fix Pack 1 for TM1 server components on top of the existing 10.2.2 environment, I proceeded to starting the TM1 Admin Host, related TM1 servers and the TM1 Application Server. Upon logging into TM1 Application Web I noticed something very strange. Even though I was logged in with an account that was a TM1 Admin (as defined on both running TM1 Servers within TM1 Architect), all published applications which appeared pre-Fix Pack 1 were missing, as well as the Administer TM1 Applications icon! If I browsed to http://:9510/pmpsvc/sysadmin.jsp all TM1 Servers which were previously added to the Application Server were showing as running, as well as showing the number of applications which were published. The fact that I could browse to the above location suggests that my account definitely was defined as a TM1 administrator. Something to note about this environment is that it was integrated with Cognos BI security, using Active Directory to authenticate users to TM1 Application Web rather than TM1 native security. However, the above behaviour could also affect TM1 native security environments. 1. Stop the TM1 Application Server from Cognos Configuration. 2. Navigate to ‘cognostm1_64tomcatworkCatalinalocalhost’ and rename the ‘pmpsvc’ folder to ‘pmpsvc_old’. 3. 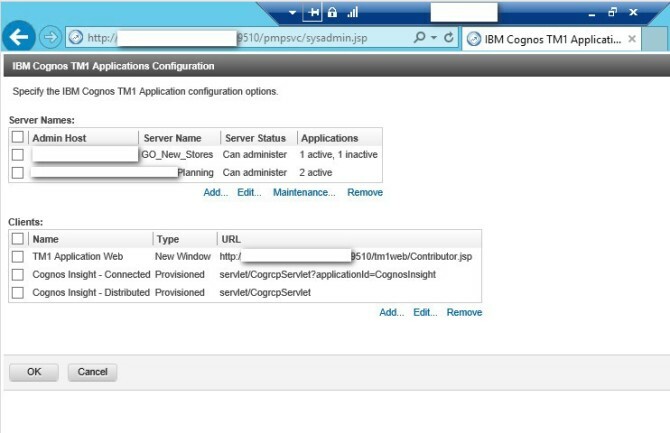 Start the TM1 Application Server from Cognos Configuration. 4. You should see a new ‘pmpsvc’ folder created within the above location. 5. Open a Web Browser, clear the cache and cookies and then navigate to TM1 Application Web and you should then see that all previously published applications have returned (providing you have permissions to those applications). You will also see the Administer TM1 Applications icon providing that you are a defined TM1 Administration within TM1 Architect.